Now this article has been a long time coming.. I've been back for nearly two months now, but it's been a hard getting back into the routine of things and I've been forgetting about this article. With the sudden amazing weather in Belgium, I figured it's finally time to get this one published. My boyfriend and I went on holiday to Florida in May for two weeks and needless to say, it was very sunny there! I am not used to lots of sun (I had a huge vitamin D deficiency this Winter to show for it) and to top it all off, I got a sudden sun allergy last year that has warned me to be cautious with how I protect my skin from the sun. 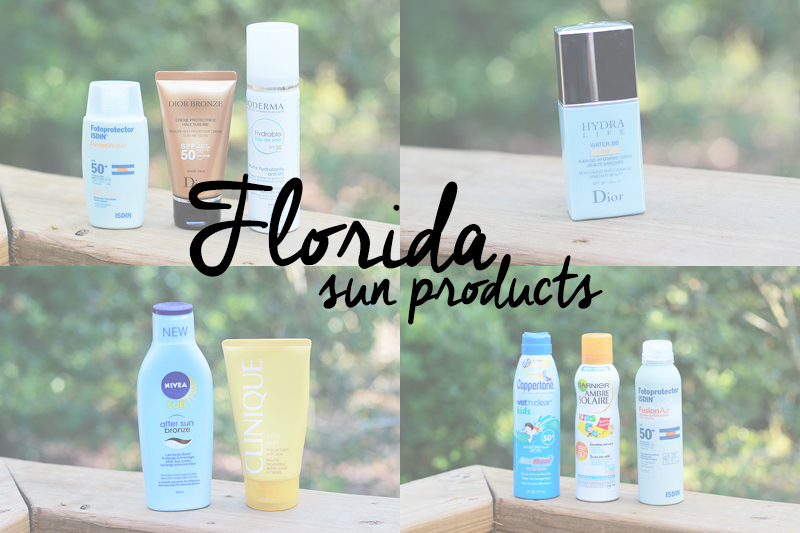 We used a whole lot of sun products in Florida, such as no less than three spray bottles of body sunscreen. Yep, I took things very seriously! Let's start off with body sunscreen. We used a whopping three full bottles of SPF50+; we made sure to reapply often enough so we wouldn't get bad sunburns. 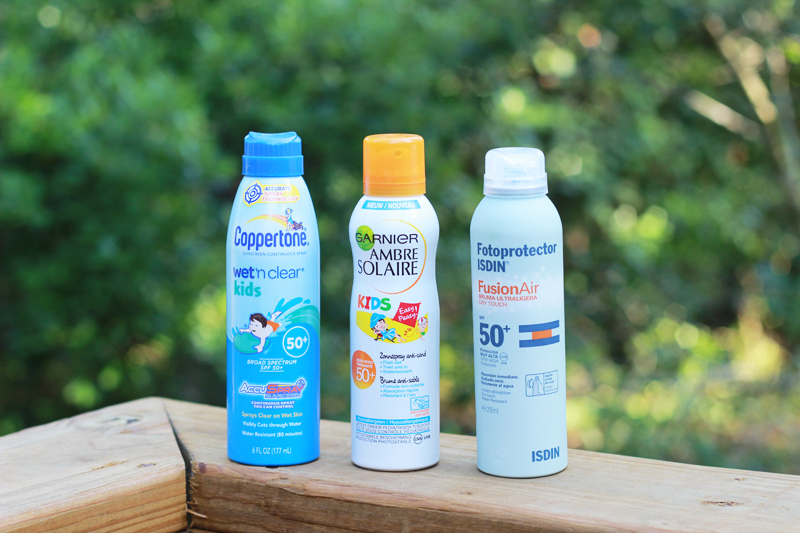 We brought the Garnier Ambre Solaire for Kids & the ISDIN Fotoprotector FusionAir Dry Touch sprays from home because these types of sunscreens are just so quick and easy to use! It's also much less prone to leaking in your bag, and trust me: you don't want a sunscreen mess in your backpack when you're on holiday. I loved using both and both protected us really well, although the ISDIN aerosol mist was a little finer and easier to use - there's almost no need to spread the product out as it's so fine and covers really well. Another plus is that both sprays aren't too sticky as they are formulated with a dry touch technology. When both sprays ran out we had to turn to a small selection of US sunscreen brands. I chose the Coppertone wet'n'clear Kids Accuspray as it sounded like the type of product I was looking for. This one was even easier to use than the ISDIN spray: the aerosol mist was super strong & fine and dried quickly. I also noticed a vague stinging feeling on my skin, so I checked the ingredients and noticed alcohol to be quite high up the ingredient list. After some more comparisons with the other sprays, I can conclude that very fine mists also mean more alcohol. I didn't notice any excessive drying of my skin, but if you're prone to drier skin or you know your skin doesn't handle alcohol too well, I'd look out for sunscreens that don't contain a super high dose. At night it's time to slather yourself with a good moisturiser or an after sun milk or balm, to rehydrate your skin and cool it down. We brought another bottle of Nivea Sun After Sun Bronze as it's a great product that does seem to help your tan stay around a little longer thanks to a pro-melanin plant extract (we brought it with us to the Cote d'Azur in 2015 too, read all about that trip here) and also tried out the Clinique After Sun Rescue Balm with Aloe. Both feel very soothing and calming on the skin, great after a day in the sun! 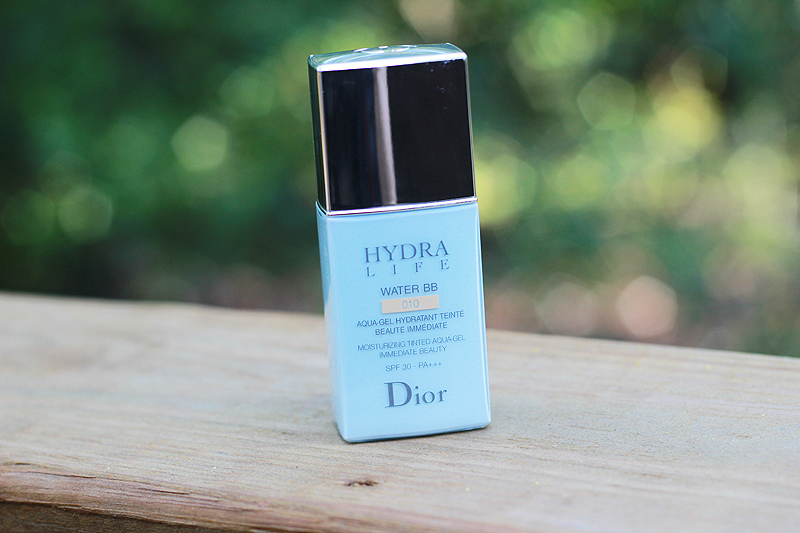 After the first week in the sun, my skin was finally tanned enough to wear the Dior Hydra Life Water BB in the shade 010. 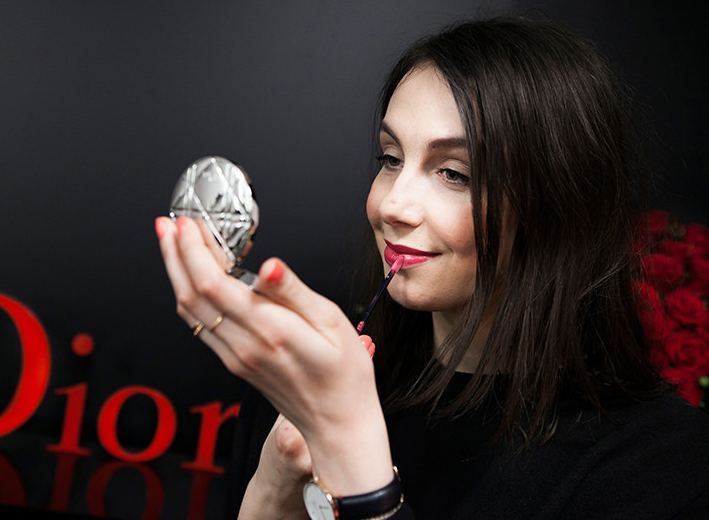 Normally Dior's shade 010 is perfect for my pale skin, but this one is a little darker than usual and just about matches my summer tan. The formula is very watery and light and gives your skin a bit of coverage and a glow, while also protecting it with an SPF30. The coverage is way too light for me for daily wear, but when I'm on holiday mode I get a little lazy and sometimes just apply a little BB cream & head out the door. This is great for mixed oily/normal skin types that don't like a thick BB cream and need something that'll both moisturise and protect, without breaking you out. Just don't expect a lot of coverage. And whenever I do wear a full face of makeup, I still like to thoroughly protect my skin. 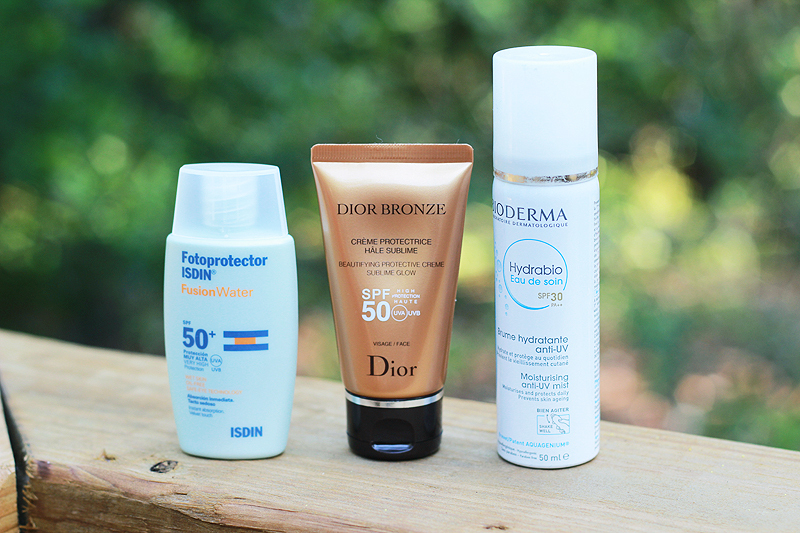 I brought the ISDIN Fotoprotector Fusion Water SPF50+ & the Dior Bronze Sublime Glow SPF50 with me to trial underneath my makeup, and my beloved Bioderma Hydrabio Eau De Soin SPF30 to reapply on top of my makeup to stay protected throughout the whole day. It's the best advice I can give: you'd reapply sunscreen on your body throughout the day, so don't forget your face either! The ISDIN Fusion Water is an oil free watery sunscreen that dries own very quickly and doesn't turn shiny too quickly thanks to sebum controlling properties. I love using this one as my T-zone can turn oil pretty quickly, but this one does a good job at keeping the shine at bay. The Dior Bronze cream is different: it's a gorgeously smelling thick cream that is super luscious to use and leaves you glowing beautifully. I'm a huge fan, although in reality I have to realise it really is a little too creamy for my skin type to use underneath makeup during summer. 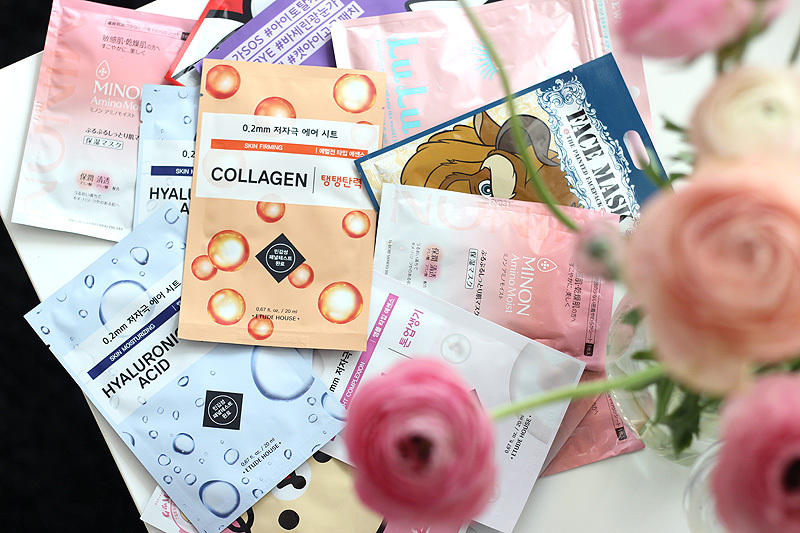 Drier skin types will absolutely love this one to use underneath makeup this summer, I will just continue to use it on its own & will keep it to use underneath my makeup this winter when my skin goes a little drier and needs all the moisture it can get. 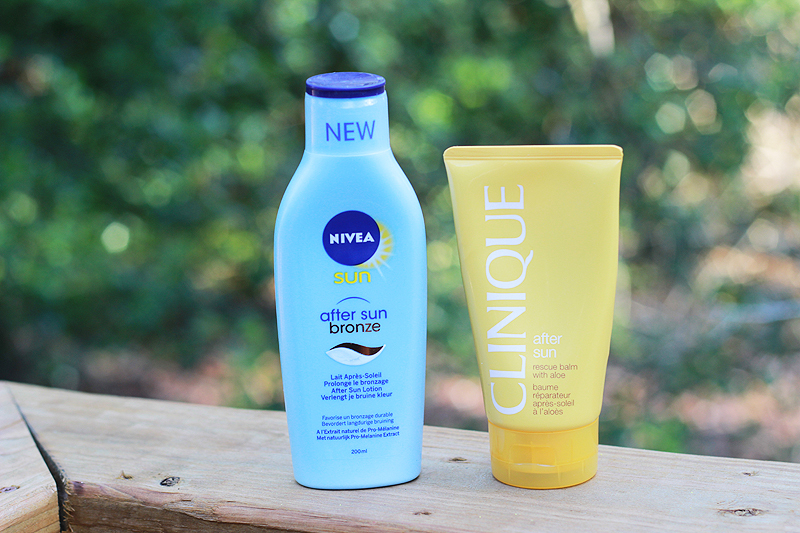 I have been using a few other sun products since coming back, so I'll be updating you on those somewhere in August. And in the meanwhile: enjoy the summer.. and don't forget to protect the skin you're in!